Lately, while working out, I’ve been watching Jaime Tardy’s interviews with millionaires. Exercise is good for you body, so why not feed your mind something healthy while you’re at it? The latest interview I watched was with Seth Godin, whose work has undoubtedly influenced mine. In case you don’t know, Seth is an expert in the field of marketing, and as I’ve said so many times before, marketing will always be in high demand, and artists should definitely be looking to increase their understanding and skills in that area. But I digress. The part of this interview I want you to hear most is from 0:47 to 4:34. The whole interview is definitely worth listening to, but if all you do is tune in to one part, that would be it. 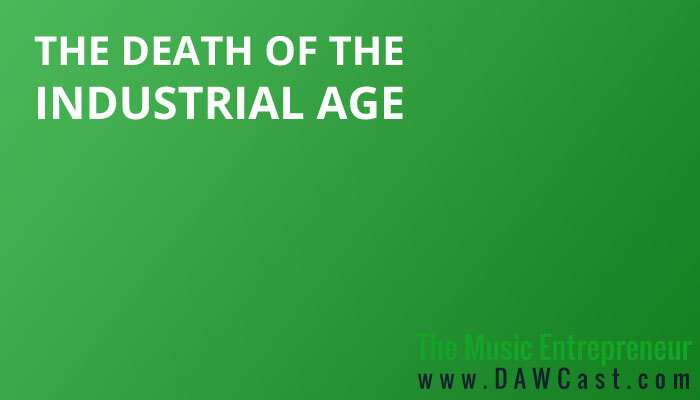 The industrial age is over, and has been for a long time. No doubt the internet or information age will also be seeing an end (and I think it will happen sooner than we think). One of the key points Seth brings up in this interview is the fact that a lot of people seek out money, then hope to add a little value on the side. Meanwhile, people who are doing something worthwhile are seeking to create value, with hopes of receiving a side dish of money down the line. A lot of people get this equation wrong. What Seth is talking about – without explicitly defining – is entrepreneurship. Interesting, isn’t it? So let’s recap; why is entrepreneurship important? Because our industrial age ideals are collapsing all around us. There is no security in jobs. There are no guarantees. The government won’t (and can’t) take care of you. What do you think? Does the information age necessitate a new mindset? Is industrial age thinking really broken? Let us know in the comments section below!